I’ve been very interested in how things financial are changing. I get a true sense that a trend is afoot where people are becoming more interested in meaningful, more frugal, more austere lives over unbridled consumption and high-reward living. Maybe I’m wrong. It’s just a sense. Perhaps it’s my head-down nature into The Satoshi Revolution and my new Patreon Initiative covering all things cryptocurrency. 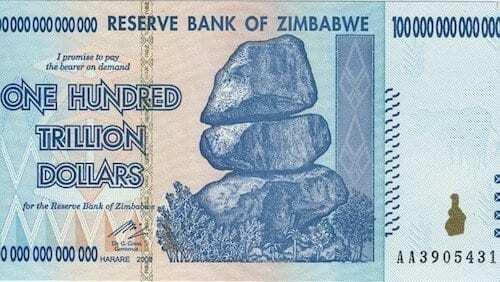 Bitcoin and other cryptocurrencies are limited in issuance, unlike fiat currencies that are unlimited—just ask any Zimbabwean about that. There will never be more than 21 Million Bitcoin. As such, for the first time in any living person’s memory, there is the potential for currency, for a means of exchange, that is not subject to continual inflation—an eroding of its value—by government whim and “stimulating the economy;” which in itself, is euphemism for inflationary bubbles that encourage people to spend, spend, and spend some more. Bitcoin and cryptocurrency, just like the technology underlying it, is inherently deflationary. At the time Apollo 11 touched down on the moon in 1969 with its primitive “computer,” all of the money in the world could not have produced the iPhone 1, now obsolete even for a Zimbabwean. Everyone has been led to believe that deflation is a bad thing, when it’s really a good thing. Everything good in economies are the result of deflationary pressures…things getting much better for the same price, the same thing going for a lower and lower price, etc. Deflationary opportunity motivates us to hold tight for now, because more for the same is in our future; whereas, inflationary pressure motivates us to spend it now, or “the deal” might be gone tomorrow. Last week I told you about Stash, a great little phone app that allows you to forego extraneous purchases on a micro level and instead, Stash the difference into a plethora of investment options. So easy, and the money really accumulates if you take it seriously, and then it grows as a portfolio of investments. Even better, you’ll get $5 to sign up, and both of you will get $5 each time one of your friends, family, or social network sign up. Since I posted that, only 15 people have signed up with my affiliate link, but Stash has given me an additional $130 of free money to invest. That’s $75 for the referrals, plus a $35 bonus for the first three referrals, then a $20 bonus for the next two. Even if you could only get 5 people to put the app on their phone and link an account to transfer funds, that’s $80 for free, stashed, and into whatever mix of 30 fund investments you choose. You just might find yourself getting the hang of this delayed gratification thing. And now I have something even potentially better for you, dubbed ZERO. But if those 10 benefits aren’t enough, it gets way better. Sure, you can just get the entry-level card and get your 1% 1.5% cash back. If you spend over $25,000 per year in purchases, you’ll get 1.5% (but you get that now, with my affiliate link). Spend $50,000 per year and you’ll get 2% back. And, finally, if you spend over $100,000 per year, you’ll get 3% cash back. But there’s a way easier way to get to that 3% level. Referrals, again, and I’ll tell you what: it’s pretty easy to get social media referrals when it’s really something and you limit your referral pitches to stuff that’s really something. I found out about this just this morning, 6am, when I got up. It was a Facebook referral from the same friend who got me into Stash. I signed up immediately because he limits himself to tips on stuff that’s really something. As part of signing up, I shared it on Facebook. Within two hours, I had enough referrals to get me to the 1.5% cash back level, and then the 2% level. And all I need is 3 more referrals and I’m at the 3% level, with no need to spend $100,000 per year in purchases. You can all easily do this too. But it gets even better, if you can believe it. Once I have those 3 more—and I’m only 6 hours into this—then every referral after that is worth a whopping $100 deposited right into the account. Astounding. I doubt there’s very many of you who don’t have enough social media props that you couldn’t pitch this in a way that would get people to sign up for their own benefit. And remember, they aren’t paying you anything. They aren’t even paying ZERO anything. They’re opening an account with their own money and are getting credit card like rewards without having the interest, fees, upsells, and balances they’ll pay exorbitant interest on. So… CLICK HERE, or click on the image below to get ZERO and get CASH. Oh, and one last thing. Did I mention that you don’t have to start at Quartz, the 1% level? Nope, because of my referrals already, all of my future referrals begin at the Graphite card level, 1.5% cash back. So, when you click in, if you don’t see “Access code for Zerocard Graphite applied!” right above where you input your email address, then you can click the link to add my unique code: SECURE23411. I will only ever tip you towards legitimate deals that offer you something real and valuable towards your financial future. Promise. Richard, I was looking at turo today, based on that same friend talking about having 7 cars he rents through them – heard about it at all? Sounds awesome, except it “feels” like a lot can go wrong. You have to work it backwards, from insurance cost, etc. You, smart enough, just go in the right direction. I haven’t done this and since I don’t live metro or near an airport, not for me now. However, I’m looking at RVShare. I’m a master at vacation rentals. The home we live in now was rented out to strangers over 500 times. Zero material damage. I had to hit people two times for $25 each for excessive cleaning, and that was passed onto the housekeeper. Keep prices at market or higher. That filters out shitholes better than anything. What price signaling is for. Thanks for the advice. Particularly about keeping prices high to filter. Most advice I’ve found on this particular concept says undercut the market. But I was thinking about the inevitable nightmare if someone screwed up your car, or killed someone. I am going to be looking at vacation rentals too – I’ve been wanting to get into rental property but conventional rental doesn’t seem worth the time given the potential return. Particularly given the real estate prices peaking in my area. Vacation rental is likely better than car rental too from a depreciation perspective, but sounds like the car rental thing is super easy to get into – like I could go buy a used car for 0 down today and start renting it asap. Well I just signed up and they gave a special to tweet a link and they put you at magnesium level 2% Just for the tweet. So heads up to others contemplating…. For those of us with teenageTwenties kids this a no brainier …. Easy way to show them stuff and put a few extra bucks in their pocket. Thank you Richard, and I’m in agreement with your “sense”. Richard, is it possible for you to put a feed to all your internet activity on your blog? Things like comments on other blogs etc? I am often dissatisfied when I see I have missed some of your cutting wit. If this is not possible, then I understand. The problem is that I have what’s called managed wordpress within a virtual server environment. This is where certain aspects of wordpress are somewhat locked down (so that other sites on the server can’t install something that takes the whole physical server down). So, basically, one is restricted in what can just be tossed onto an install with plugins. Not necessarily impossible though. The only thing is I’m in limbo. My host just moved me over to a new host and we’re keeping everything the same over the next month to identify any potential problems with the move. Once that’s done, I’ll be looking to do a redesign of the blog and will put this on the list to look into.